Big thanks to all who made time to come and lift, the now re-furbished, Bluejacket off the wooden stollage and on to her trailer. Some of you travelled considerable distances to make it – much appreciated. Again we owe a huge thank you to Barrie, not only for letting us clutter up his workshop, but for the odd hours he slipped in to make sure Bluejacket came out looking gleaming. No-one rushed away. Andrea’s hot drinks and biscuits were excuse enough to stay and mull over things Skiffie and Blakeney. Robin, Amy, Helen and Barry (with only a little persuasion) took up brushes and touched up the blue paint on the well worn original set of oars. Others of us watched and chatted, offering ‘advice’ to the painters as needed! The plan is to put Bluejacket back on the Carnser early Tuesday 1 March. Hoi Larntan will then stay at Cox’s yard, Barton Turf – probably till just before Easter (could be longer) so we cover our options. There is not much water at Blakeney during daylight hours for a while yet, but outings at Barton are readily available. Check the calendar and put your name down, others will follow. Don’t be shy of being the first on the list. The names and contacts of the ‘authorised’ rowers are on our Groupspaces web-page if you are stuck for someone to lead the outing. Frost and grey skies forecast, but as we arrived at Barton Turf, little or no wind and glimpses of blue behind the clouds promised better – and better it became. I timed my arrival to perfection. 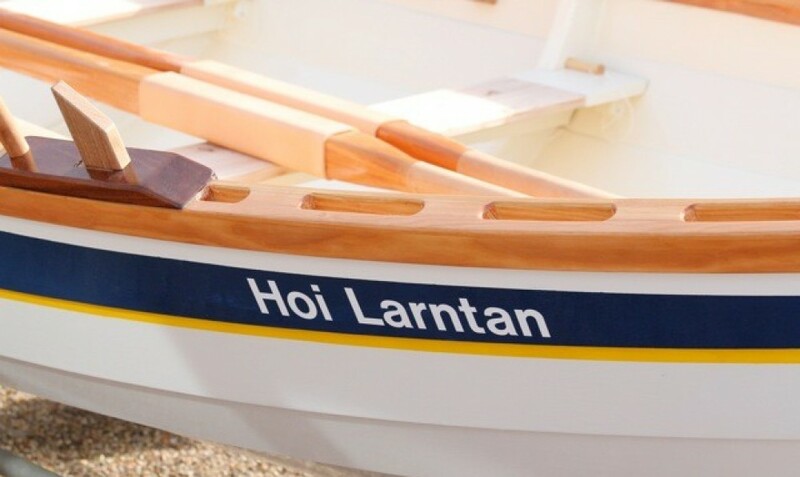 Hoi Larntan was in the water, oars shipped and just waiting for me to clamber aboard and squeeze into the cox’s seat. Gently gathering our rhythm we followed the channel towards Wayford, passing a bunch of chaps felling trees and generally tidying up the banks. Bare trees silhouetted against the skyline and plenty of twists and turns to keep us on our toes, we came to the bridge at Wayford with its exhortations to “Lower windscreen etc, Keep off deck and Sound horn” – none of which did we do. With five firm strokes as we approached and a swift pulling in of oars, we shot calmly through and continued on our way. There seemed, unusually, to be very little wildlife of note and only a passing helicopter to break the silence. Just because it was there we took the narrow branch toward Dilham – not realising just how narrow it was going to get. Inching past overhanging branches and skirting reeds, we came to an empty bay where we could tuck in against the modern wooden quay and jump out to stretch our legs. Coffee consumed (and Tom’s rich fruit-cake wickedly enjoyed) we couldn’t resist the temptation of a sign pointing us further to ‘Dilham Staithe and Turning Point’. If the journey so far had been in narrow waterways, this was paddles-only stuff. We scraped through and duly executed our turn – Robin now coxing. This must be the farthest we have explored up this channel. Certainly there was no chance of going any further. Easing oars to glide past a couple of boats with men (and dogs) fishing we wended our way back to Cox’s yard. A delightful outing and the sun did finally make a wan appearance. Thanks to Robin for the photo. “A good row this morning, we arrived at How Hill in 35 minutes so decided to row on to Ludham, Bridge. Taking it in turns to cox and occupy each of the four thwarts, we hardly noticed the time passing; sharing various anecdotes and “jokes” with varying degrees of amusement. Only one thole pin was broken on the outing and this time we promised not to mention any names. The new thole pins look very bright and clean. Many thanks to Alan of the words and pictures – and the rest of the crew. If you can spare a half hour this Saturday afternoon 27th. at Bayfield please, we need to lift Bluejacket back on to her trailer. I know some of our regulars can’t make it so please come if you can. Many thanks to all of you who have helped with the sanding and painting over the past few weeks. While some are still enjoying the wind, rain, frost and occasional beautiful winter sunshine rowing out on the briny (well, Barton Broad and the river Ant) others toil to keep the boats and oars up to scratch. In fact, the boat and oar builders occasionally take time to row and the rowers take their turn in the workshop. Bluejacket’s interior is ready for the gloss top-coat of cream paint (relentlessly referred to as ‘magnolia’ by our worthy Captain) – so come along tomorrow Saturday 20th., please, to wield a brush. With hearty thanks to Barrie for much strenuous labour during the week, Bluejacket is now converted to a thole-pin and kabe arrangement of oar-locks to match Hoi Larntan. Both boats and sets of oars should now be interchangeable. A dusty view of the other workshop shows where the latest oars are taking shape. The four sections are cut and then hollowed out using Rob’s grandfather’s beautiful and very effective, wooden router or ‘bollow’ planes. Learning to sharpen the semi-circular blades is an art in itself. Now shaped, the sections of each oar are ready to be glued together. Then starts the planing, sanding and shaping of the outer faces to make the oar-shaped looms. Then, there is the small matter of inserting and shaping the oak handles. Then, …on and on it goes. These pins are made for breaking! ‘Hurricane’ Storm Imogen with its predicted rain and winds of 29 gusting 46 mph did not put us off. The reality was, we undertook a careful safety-check on our window of opportunity to row before Imogen reached the Norfolk Broads. We had a strong crew, sturdy boat and as mentioned in a previous blog, excellent oars! The après-refreshment row was uphill, or so it seemed. In fact we were now rowing against the wind with gusts we estimated at 35mph. The wind catching our oars made us think of feathering them! Some powering up with lovely long recovery phases soon sorted the little question of forward propulsion. Tom’s hat blew off and had to be rescued; thank goodness for the boat hook – unfortunately the camera was not to hand! Neither was the camera to hand when Richard tested the metal (sorry, no metal in St Ayles Skiffs) of our Beech thole pins. They broke perfectly each time he caught a crab. He was a good sport and posed, later, with both pins; one a greenstick break and the other clean in two pieces. Thanks to our correspondent Alan for words and photo. A successful afternoon on Saturday saw a first coat of gloss white paint on the hull of Bluejacket (Ian and Barrie had applied a good primer/undercoat layer earlier in the week). As an experiment, paint-rollers were used as well as brushes, causing some scepticism among those who had not tried them before! The result was a pretty fair finish but maybe, to provide the thickness of protection we are looking for, a second coat will be needed. The main topic of conversation centred round the chances of getting an enjoyable row in all this stormy weather. It was nice to be in Barrie’s warm, dry workshop/barn, sipping Andrea’s tea-time treats. Thanks to her and all who helped. Next Saturday 13 Feb it would be great if a few more of us could spare half an hour again to come and assist with turning Bluejacket back upright so we can start on the interior and the varnish. (We might try weighing the boat too…). Meanwhile, three or four volunteers have been helping Rob to cut and shape the Sitka Spruce for the next set of oars. These are to be hollow like the recent set which a number of people have used now, and which have received the thumbs-up for their better balance. Next step is to start glueing the sections together and turning the oak end-pieces to make handles. We’ll try to add up all the hours that have gone into making these oars – once we’ve finished them! Another windy day didn’t prevent today’s outing to St. Benet’s Abby going ahead: hard work on the outward leg, much of which was into the SW wind, especially across Barton Broad, but easier for much of the return leg, where we averaged 3.9 MPH with a peak of 5.2. Total trip was 11.8 miles, some 3 1/2 hours of rowing. Tomorrow, back to oar making, second set to the new design are coming along, we’ll have matching oars in both boats for the coming season…..